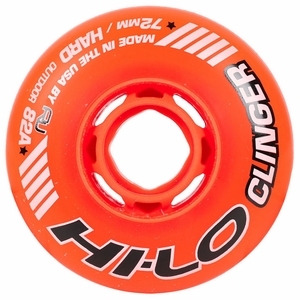 The HI-LO Clinger Outdoor Hockey Wheel features a good exterior urethane that will last long outdoors while providing excellent grip on asphalt or concrete. The urethane is hardened on the outside so it won't wear down quickly but still bends when you turn for increased surface area, resulting in better grip. These wheels were designed and poured by Revision in the USA.